Amaranth is one of Central and South America's best-kept secrets, a "super-food" that offers intense nutritional value and very few calories. Learn all about the grain's rich history and future potential to get inspired to add more of it to a balanced diet. Geographic distributionSouth America, Central America, Asia and Eastern Africa. As one of many well-kept secrets of South American cuisine, kiwicha, or pendant amaranth, has yet to find its merited worldwide reputation as a staple source of food. New health-conscious initiatives, however, may change that fact very soon: the plant boasts one of the longest histories of use in the Americas for good reason, and its immense nutritional value is garnering "super-food" status slowly but surely around the world. Read on to learn more about its Andean legacy and multiple uses today for inspiration to incorporate it into daily life. In the areas where it is cultivated, amaranth have been used mainly as a food for its amazing nutritional content. 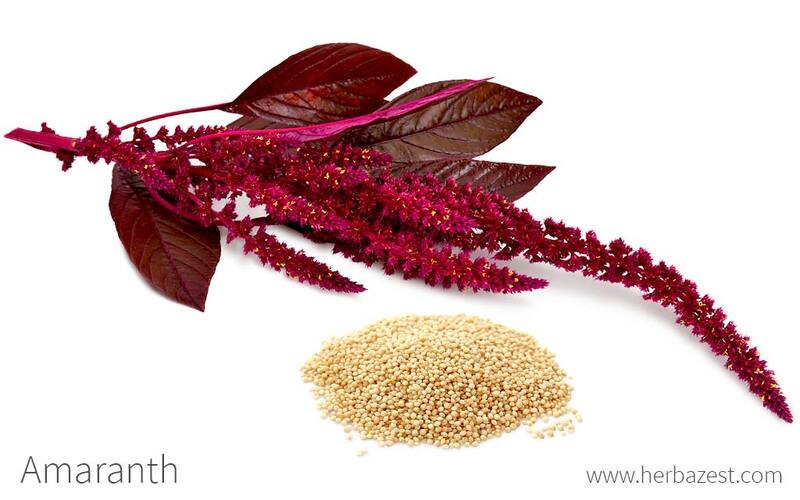 Traditionally, amaranth has been consumed for supplementing calcium intake, since it is rich in this mineral. Stimulating bowel movements. 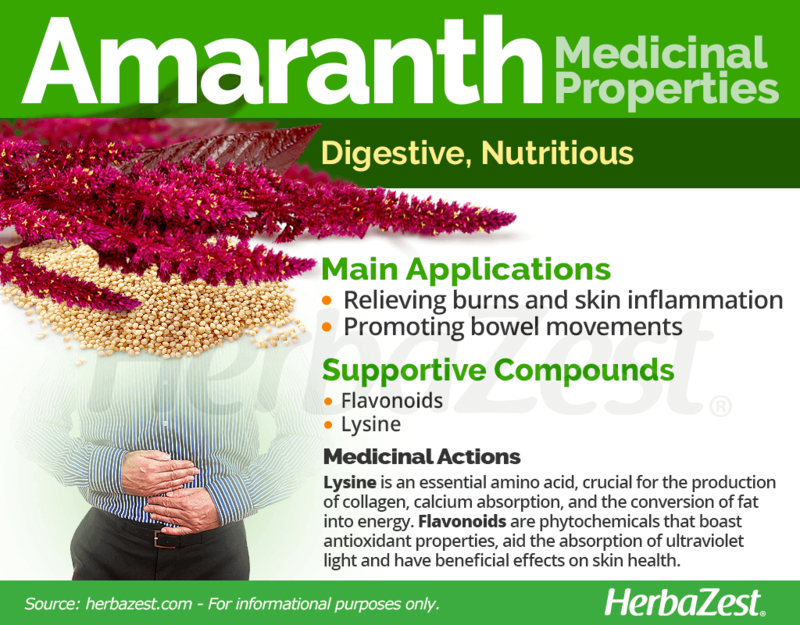 Amaranth is particularly rich in fiber, which helps regulate intestinal functions. Relieving cold sores. The plant can also be used topically to sooth irritated skin and reduce inflammation. Enhancing cognitive performance. Some studies suggest that amaranth may play a role in preserving and improving cognitive abilities thorough life. 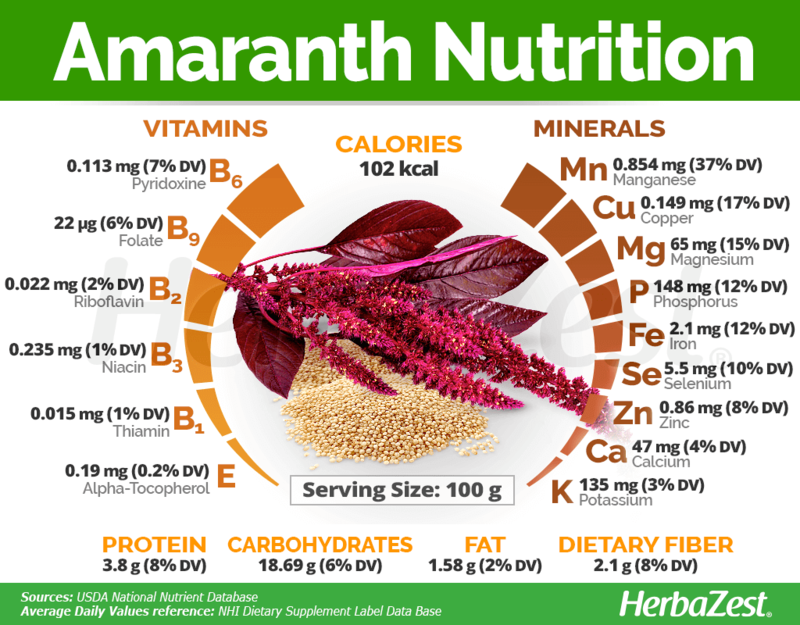 Touted as one of the world's healthiest foods, amaranth is an incredible source of nutrients - particularly for children, who can get as much as 70% of their necessary dietary energy from one serving. Amaranth contains high concentrations of phosphorus, potassium, calcium, iron, zinc, vitamins B₁ (thiamin), B₂ (riboflavin), B₃ (niacin), B₆ (pyridoxine), and E, along with flavonoids. AMARANTH CONTAINS 10% MORE PROTEIN THAN ANY OTHER GRAIN, INCLUDING THE ESSENTIAL AMINO ACID LYSINE, WHICH CANNOT BE PRODUCED BY THE HUMAN BODY. Flavonoids are phytochemicals that boast antioxidant properties, aid the absorption of ultraviolet light and have beneficial effects on skin health. Many of amaranth's medicinal applications come from its richness in the amino acid lysine, which is crucial for many functions in the body. It plays a role in the production of collagen, calcium absorption, and the conversion of fat into energy. Several other traditional uses are still undergoing research to substantiate their claims. Sacha inchi and quinoa also possess nutritious properties, whereas kiwi and pineapple can be used as alternative sources for digestive benefits as well. 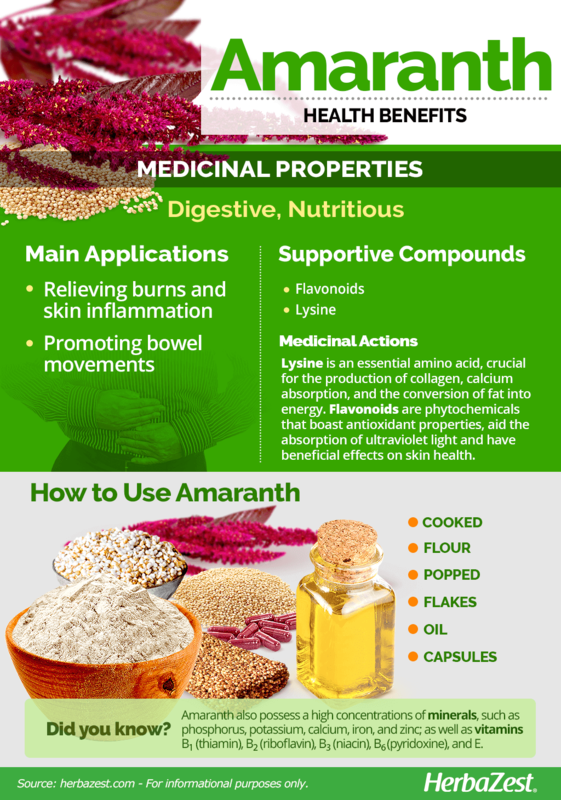 Amaranth's use as an herbal medicine is derived mainly from its high content of vitamins and minerals. Because of its high protein and low calorie value, it is an effective weight loss tool, additionally preventing excess buildup of LDL, or "bad" cholesterol. 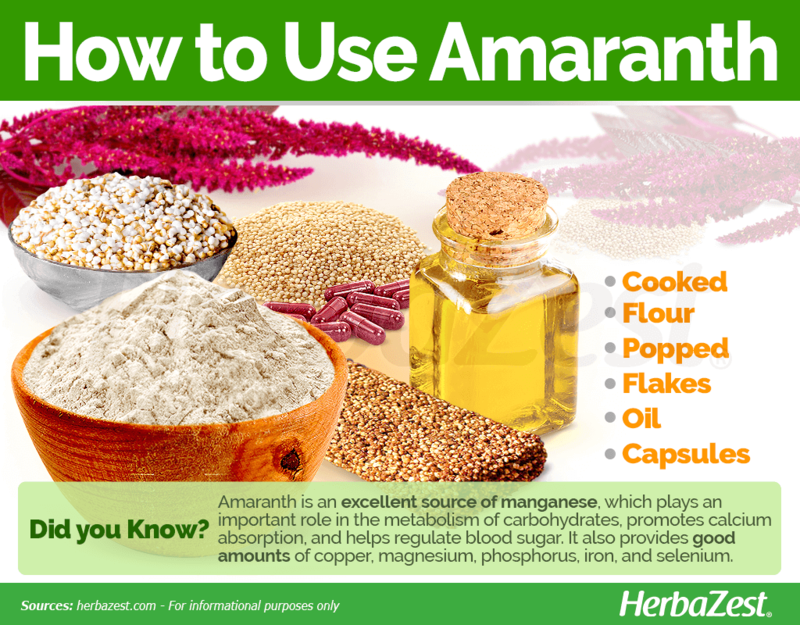 Amaranth is an excellent source of manganese, a mineral that plays an important role in the metabolism of carbohydrates, promotes calcium absorption, and helps regulate blood sugar. Amaranth is also a good source of: copper, a trace mineral essential for bodily functions, particularly red blood cells production; magnesium, necessary for energy production and blood pressure regulation; iron, which promotes the formation of red blood cells; phosphorus, crucial for carbohydrates and fats metabolism, as well as for protein production; selenium, which helps prevent cellular damage and supports thyroid hormone metabolism; zinc, important for immunity, as well as for carbohydrates breakdown; vitamin B6 (pyridoxine), which plays a key role in brain development and function, as well as in the regulation of mood and sleep cycles, vitamin B9 (folate), important for fetal development and iron absorption; calcium, essential for strong bones and teeth, as much as for hormones' regulation. Amaranth seeds also contain small amounts of other nutrients, such as potassium, other B-complex vitamins (thiamin, riboflavin, niacin), and vitamin E.
100 grams of cooked amaranth seeds provide 102 calories, as well as 8% of the daily value for protein and dietary fiber, respectively. Both traditional and modern uses for amaranth have been mostly culinary, with the leaves and seeds of the plant being a food source. However, amaranth is increasingly being used as an ingredient in dietary and herbal products. Raw. The nutty-flavored amaranth seeds can be cooked like rice, in soups, salads, and stews. Flour. When finely ground, amaranth can enrich the nutritional content of soups, sauces, and baking goods, and it can be used as a gluten free substitute for wheat flour. Popped. The popped seeds of amaranth can make a great topping for salads, and desserts. Flakes. Amaranth flakes can be cooked in the same way as oats and consumed as a breakfast cereal. Amaranth leaves are said to have a similar flavor to spinach and can be used in soups and salads, giving off a mild flavor. Oil. Many health benefits are attributed to amaranth's oil, including lowering blood pressure, aiding cardiovascular function, and improving skin appearance. Capsules. For those looking to reap the plant's many health benefits in consistent doses, amaranth can be found as a powder in capsules. Appropriate concentrations differ between individuals, so it is important to follow label instructions and consult a healthcare professional before embarking on a supplemental regimen. As its international reach begins to grow, amaranth -or kiwicha- can be found in an increasing number of grocery stores and supermarkets year-round. In some locations, seeds may only be available in ethnic markets or specialized health food stores, but health-conscious movements are working to change this for the well-being of all consumers. Herbal supplements that feature amaranth are available through specialized herbal stores. However, online retailers provide consumers with the widest variety of possibilities regarding style and price. An annual species, amaranth (Amaranthus caudatus) grows in conditions that are similar to those of its relative quinoa (Chenopodium quinoa) and other members of the Amaranthaceae family; however, it is surprisingly tolerant of a wide range of weather conditions. Amaranth survives at temperatures of 39 - 104°F (4 - 40°C), although it prefers moderate warmth between 70 - 82°F (21 - 28°C). Altitude is also a shifting variable, as native growths appear at sea level as well as in mountainous altitudes up to 11,800 feet (3,600 m) above sea level. Loose, loamy soils are ideal, though the plant also tolerates salty ground. Amaranth do better in soils that are slightly acidic to slightly alkaline. Proper moisture is critical to initial propagation and pollination. It takes approximately four to six months before seeds are ready to harvest, though each plant can generate up to 100,000 seeds at a time. More detailed information about growing amaranth can be found in the herb garden section. Though normally shorter, amaranth can reach up to 8.2 feet (2.5 m) tall, and branches from the central stalk may start as low as the base, featuring cylindrical panicles of deep red to white flowers that can reach 35 inches (90 cm) long. Large, elliptical leaves are also in abundance, and small, single-seed fruits occur in massive numbers per specimen. The seeds are chiefly put to human use. Pendant amaranth, or kiwicha, is a member of the Amaranthaceae, or amaranth family, a classification it shares with roughly 2,500 other species of diverse flowering plants, including crops of economical importance, such as quinoa (Chenopodium quinoa) and spinach (Spinacia oleracea). There are over 1,200 naturally occurring varieties of amaranth, generally distinguished by the form and color of the plant's flowers, steam, and leaves. True cultivars have been developed in Peru for the most part, including 'Noel Vietmeyer', a taller version whose seeds are valuable for making flour, and 'Alan Garcia', a shorter plant that produces a higher yield, although it is prone to contamination by pests. Ranging from the Peruvian Andes to as far north as Mexico, different members of the Amaranthus genus have grown wild throughout Central and South America for at least 7,000 years, although its exact point of origin is unknown. Among these, amaranth is a native from the Central Andes that sets itself apart thanks to its tolerance of various growth conditions, ranging from high mountainous altitudes to sea level. One of its common names, kiwicha, is derived from the Quechua word for the plant, and many English terms, such as "love-lies-bleeding" and "velvet flower," refer to the deep red color of its blooms. Today, amaranth is widely consumed in Central and South America, with production centering around Peru, where the majority of the world's supply is generated for alimentary and other uses. In 2011 alone, the country yielded over 3,400 tons of the edible seeds, primarily for domestic and regional use. Bolivia, Ecuador, and Mexico are also known for their cultivation efforts, but these occur on a much smaller national scale. Potential for crops in China, Nepal, and India is now receiving more attention. Cornell University, Growing Guide - Love Lies Bleeding.